Rounaghi, S., Kiani-Rashid, A. (2011). The effect of quenching media and annealing temperature on graphitization transformation kinetic of CK100 tool steel. International Journal of Iron & Steel Society of Iran, 8(1), 34-38. S. A. Rounaghi; A. R. Kiani-Rashid. "The effect of quenching media and annealing temperature on graphitization transformation kinetic of CK100 tool steel". 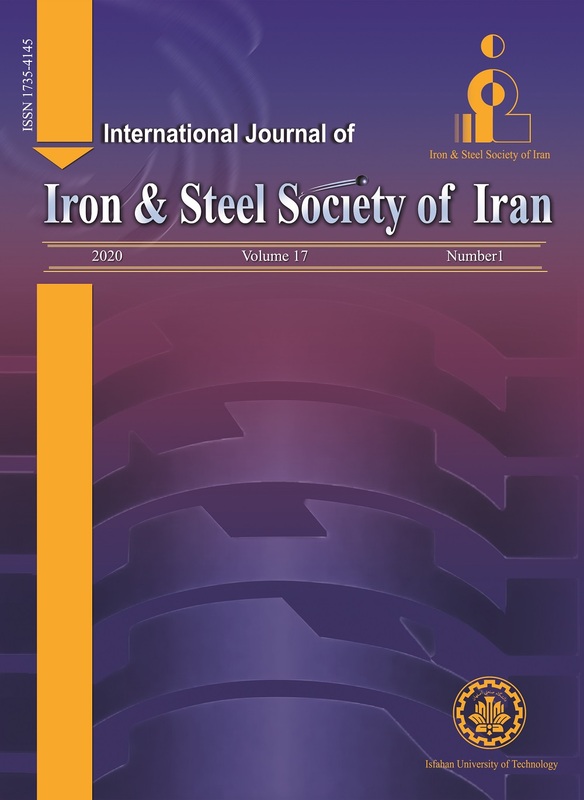 International Journal of Iron & Steel Society of Iran, 8, 1, 2011, 34-38. Rounaghi, S., Kiani-Rashid, A. (2011). 'The effect of quenching media and annealing temperature on graphitization transformation kinetic of CK100 tool steel', International Journal of Iron & Steel Society of Iran, 8(1), pp. 34-38. Rounaghi, S., Kiani-Rashid, A. The effect of quenching media and annealing temperature on graphitization transformation kinetic of CK100 tool steel. International Journal of Iron & Steel Society of Iran, 2011; 8(1): 34-38. In this research, graphitization transformation of a commercial hypereutectoid steel called CK100 was studied by the dilatometric experiments at the range of 600 – 700 °C from prior martensitic structure. Also the effect of quenching media on the initial graphitization time and completion of transformation has been discussed. Also, graphitization transition from the different prior microstructures was studied using microscopic observations. Analyzing dilatometric data acquisitions confirmed good following results from Johnson–Mehl–Avrami equation. By calculating Avrami exponent, following of transformation kinetic from diffusion controlled nucleation and growth was resulted. Also, the minimum time for completion graphitization transformation was concluded about 45 hrs relative to the water quenched specimen after annealing at 670 °C. S. Katayama and M. Toda: J. Mater. Process. M. Okonogi, H. Kanisawa, M. Hashimura and S.
D.V. Edmonds: Acta Mater., 55 (2007), 2919. K. Banerjee and T. Venugopalan: Mater. Sci. M.A. Neri, R. Colás and S. Valtierra: J. Mater. Process. Technol., 83 (1998), 142. M. Avrami: J. Chem. Phys., 8 (1940), 212. Bagoury: Mater. Sci. Eng. A, 430 (2006), 285. J. Mater. Sci., 41(2006), 5235. S.A. Rounaghi, P. Shayesteh and A.R.